an editorial in the Australian argues that whatever "the deranged motivation" behind it, it still succeeded in achieving three outcomes. First, it attracted immediate global coverage. Second, it crippled the centre of the country's biggest city, 10 days before Christmas. And third, it planted "a new wariness in ordinary Australians going about their daily lives". "For many of us," the editorial says, "the crisis made the realities of terrorism, whatever its source, hit home hard." an editorial in Australia's Daily Telegraph says, it is also true that "a significant minority of our Muslim community harbours extremist views that are abhorrent to all Australians, including fellow members of their faith". The editorial warns that Australians will now have to adapt "to a new reality" - "we are now in the front line of a terror conflict". It has been a harrowing day for relatives of the hostages, who had to wait many hours before hearing news of the fate of their loved ones. Adam Houda, a well-known Sydney solicitor who had represented Man Haron Monis, is the latest in a long line of people to question the dead gunman's sanity, describing him as "mad as a cut snake". Thomas Erdbrink tweets: Former classmate of Sydney attacker "Sheikh Haron" tells me he has never met a more crazier person in his life. "Completely nuts". Iranian Foreign Ministry spokeswoman Marziyeh Afkham has condemned hostage taker Man Haron Monis, arguing that his poor mental condition was "obvious". Mrs Afkham said that Iran had repeatedly raised concerns about Monis - an asylum seeker from Iran - to Australian officials over the last two decades. She said that resorting to violence in the name of Islam was not acceptable. "In the past 24 hours this city has been shaken by a tragedy that none of us could have ever imagined," New South Wales Premier Mike Baird said at the start of the police news conference in Sydney. "Today we must come together as never before. We are stronger together. We will get through this. Unbelievably overnight we have lost some of our own in an attack we never thought we would see here in our city." Police say that hostage-taker Man Haron Monis, 50, was shot and pronounced dead after being taken to hospital. New South Police Commissioner Andrew Scipione tells the news conference: "We have a male police officer who has been injured as a result of a gunshot wound to the face. I have talked to that officer. He is in good condition. He is currently being assessed and will be remaining in hospital for some time. Not too long, we hope, but he is well and grateful to be alive, let me assure you." Police have just held a news conference in Sydney on the cafe attack. In it, they said that if they did not attack the premises when they did, more people would have died. They would not reveal whether the two hostages killed were caught in crossfire or shot by the gunman. The cafe has been secured and there are no explosives still inside, police say. There was a "vicious horrendous attack" that has taken place in our city, police say, and all questions relating to it will be answered in the days and weeks ahead. Police moved in when there was an exchange of gunfire inside the cafe, the news conference is told. The emphasis now is looking after the hostages and their families, police say. Police say that if they did not enter the cafe when they did, many more lives would have been lost. Police have accounted for 17 hostages, two of whom are dead, police say at the press conference. A police statement says that four people were injured in the incident. The hostage taking stand-off was an isolated incident, police say. Police say that the dead include a 34-year-old man, a 38-year-old woman and a 50-year-old man who it is thought to be gunman Man Haron Monis. Australian police say three people were killed and four injured in the siege. "The decision as to when to go into an operation and use force is a fine balance and its about gain," Henderson Risk Limited CEO Duncan Bullivant told the BBC. "If time is going to give you the gain for a peaceful negotiation, you've got to negotiate. "But if the negotiations, or the people you're negotiating with, seem unstable or you're moving to a point where the people on the ground believe that there is a risk to the hostages then force has to be used". Two Muslim men performed prayers for peace in the aftermath of the hostage-taking incident near to the cafe where it took place. In a statement, several Muslim groups in Australia criticised the gunman's actions. Reports say the New South Wales police are due to hold a news conference shortly. Will bring you all the latest updates and reaction to this fast moving story. Man Haron Monis has made numerous court appearances in Sydney over the last five years. Australia's Daily Telegraph about his lucky escape. Australia's 2EU Radio reporter Leonie Ryan tells the BBC that - according to "well-placed police sources" - the decision to storm the cafe "was completely unplanned". She says: "We're hearing reports that Man Haron Monis actually fired the first shots. Police made the decision to storm into the cafe after hearing gunfire." Police and emergency services speedily moved into the cafe area shortly after five or six hostages were seen fleeing the building. Loud bangs and shots were also heard. Who are the radicalised members of Australia's Muslim community and how large is the problem? Here's a 90-second BBC video. Here's the dramatic footage of police storming the cafe. The full extent of injuries suffered by those who were held hostage is still not clear. A hostage and the gunman are believed to have died during the stand-off, media reports say. "This is a one-off random individual. It's not a concerted terrorism event or act. It's a damaged goods individual who's done something outrageous,'' Man Haron Monis' former lawyer, Manny Conditsis, tells the Australian Broadcasting Corporation. BBC profile of the self-styled Muslim cleric. The number of injuries among the hostages and the fate of the gunman are still not clear. We do know that several people were carried out from the scene on the stretchers. 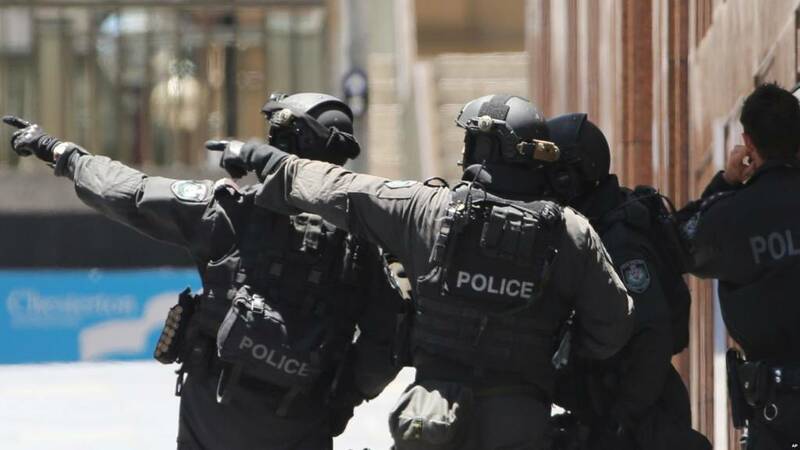 To recap: The Sydney cafe siege is over after armed police stormed the building amid the sound of gunfire. The police are believed to have launched their operation after at least five more hostages escaped from the cafe - more than 16 hours after the stand-off began. Armed police and medics are at the scene and several people have been taken away on stretchers. tweets: Sydney siege is over. More details to follow. A person on the ground appeared to have been treated by medics. Terrified hostages were later seen running out from the cafe. The Guardian's Helen Davidson in Martin Place says a bomb disposal robot is now going into the building. Police have stormed the cafe where the gunman has been holding a number of people hostage, AP and Reuters news agencies say. Emergency services brought in at least two stretchers to the scene. Earlier, medics appeared to be providing first aid to an injured person. Shots appear to have been fired outside the cafe, Reuters images show. Live footage showed police carrying out a crying woman - believed to be one of the hostages. Reports also say a loud bang was heard in the area. At least five more hostages escape from the cafe, media reports say. tweets: The incident in Sydney is disturbing. Such acts are inhuman & deeply unfortunate. I pray for everyone's safety. Britain's Terry Waite - who was held hostage in Lebanon for four years - tells the BBC the best thing the hostages can do is keep their heads down, and not try to curry favour with the gunman. "As far as you can be cool, calm, controlled; answer the questions to the best of your ability, and just don't betray any sense of panic, because that sometimes can excite and cause hostage takers to behave excitedly themselves." reports that Man Haron Monis is well known to the Australian police. The cleric is currently on bail for being an accessory to the murder of his ex-wife and is facing more than 40 sexual and indecent assault charges. Below is an archive image of the suspect. the Sydney Morning Herald reports. Man Haron Monis is currently on bail for a string of violent offences and has a conviction for sending offensive letters to the families of deceased Australian soldiers, the BBC's Jon Donnison in Sydney reports. Police say they believe the man who seized hostages is Man Haron Monis - an Iranian-born cleric who has been granted asylum in Australia. tells the BBC World Service's Newshour programme: "If he's alone then he cannot take turns guarding hostages, cannot rest, so as long as this incident stretches out he will become so fatigued that from high-level demands he will start looking for a way out." Adam Dolnik, a hostage negotiator and Director of Terrorism Studies at the University of Wollongong in Australia, says the fact the gunman is alone and is likely to be tired could be used to negotiator's advantage. tweets: #IllRideWithYou shows you shouldn't be scared to be Muslim. You should be scared to be racist. tells Australian radio he texted her to say he was inside the Lindt cafe. The woman, identified as Mel, said: "He sent me a message saying 'I'm ok mum can't talk' and I haven't heard anything since." The car-sharing service Uber has faced criticism after apparently hiking prices for customers wanting to leave central Sydney. As the crisis unfolded, people in the area faced fees four times normal rates. The company said it had increased prices to encourage drivers into the area. But it later said journeys would be free. "This massive police operation is still very much under way. We've just been down to the police cordon, about 500 metres away from the Lindt cafe, and there's still a lot of heavily armed police officers in the area. And what police are saying at the moment is they are urging patience, their ultimate goal is to get everyone out safely, and they are saying that might take some time." looked at some of the selfies taken at the scene - including one using the hashtag #hostagesituationselfie - and the angry responses they have provoked on social media. most powerful images from the siege. police continue to surround the cafe where the hostages are being held. Danielle McGrane, from Dublin, lives in Sydney where she works as a music journalist. She said: "The city feels eerily calm and quiet, especially for this time of year in the lead up to Christmas... Nobody said a word on the train home, it was the quietest train journey I've ever experienced on that line." their latest statement, police have urged people in Sydney to go about their business as usual on Tuesday. They are continuing to cordon off areas around the cafe and have advised on a number of closures. Suzanne Williams, former head of the London Metropolitan Police unit for hostage negotiation, told the BBC: "The primary objective is to ensure the safety of the hostages above everything. Part of this is to reassure the hostage takers themselves - keep them calm, no surprises." BuzzFeed reports. One tweet read: "People's lives are in danger and people are taking selfies in front of the Sydney siege, how disrespectful and idiotic." looks at where the hashtag #illridewithyou started. Thousands of people have now joined the spontaneous campaign, offering to meet Muslim people at their local stations and to ride with them on their journey. It is late evening in Sydney now, and armed police have the Lindt cafe cordoned off and surrounded. This was the scene near the cafe a few moments ago. Guardian has a piece on how the hashtag #illridewithyou is being used to spread a message of tolerance on social media. The newspaper says the trend was started by Tessa Kum, a TV content editor and writer living in Sydney. Huffington Post has brought together video and images showing the moments hostages fled the cafe. told the BBC's Outside Source programme he is likely to be working alone. "Certainly this appears to be the actions of a lone actor, perhaps not very well prepared, perhaps not very well planned, and the indications of the demands that he's making seem very odd for a hostage taking incident where you would expect materialistic or strategic demands to be made in connection with a particular group or cause." Sydney Morning Herald's editorial on the siege has "tested Australians as individuals, and Australia as a civil and democratic society". It says the next test will be for people in Sydney not to jump to conclusions about the motivations of the gunman. Here's an update on the #illridewithyou hashtag on Twitter - it is currently the most popular trend worldwide, with more than 54, 477 tweets in the past hour. New South Wales government website has a map of the exclusion zone and will have updates on whether buildings such as the Supreme Court, which is nearby, will open on Tuesday. #illridewithyou - more than 24,000 tweets in the past hour. The hashtag emerged in the past couple of hours and in support of Muslims who may fear a backlash. As the hostage story continues in Australia, armed men have reportedly taken a man hostage in Belgium. But the authorities there have ruled out a connection. "There is no indication that this is linked to terrorism, the Islamic State or what is happening at the moment in Sydney," the Ghent prosecutor told AFP. tweets: We know who the hostage taker is. We will not be reporting it on the request of @nswpolice. Hope other media outlets follow. says the PM Tony Abbott summed up the mood of the nation earlier when he talked about how terrifying it must be for the hostages to go into night-time having been held captive for more than 12 hours. One can only guess the fear, the panic, the terror going through their minds, our correspondent adds. The Australia hostage story has gained very little traction among online jihad supporters, who are often quick to link incidents with their cause, BBC Monitoring reports. Only a few Islamic State supporters reported the news, with one saying that the motives of the hostage-taker were unknown. No claims of responsibility by any group have been seen by BBC Monitoring. says: "The police appear to be preparing for the possibility the siege will continue into Tuesday morning and possibly longer. Commissioner Scipione has made it clear he does not want to put any of the hostages at risk by rushing the operation and he indicated at his latest press conference he would be calling in more police." to the BBC World Service's World Update programme: "The vigil crossed many different religious groups - Muslims, Catholics, Protestants, Jewish communities... This is a showcase and demonstration that the community can come together in solidarity and work together as a family to try to address whatever issue that we face collectively." A black flag was the battle flag of the Prophet Muhammad and was carried into battle by many of his companions. Today a black flag with the white Arabic text of the "shahada", the basic statement of the Islamic faith, is used as a symbol of engagement in jihad, in the sense of holy war, by militant groups including al-Qaeda and Islamic State. The flag raised in the window of the coffee shop is similar but different to that of IS, which bears the first part of the shahada and the seal of the Prophet below it. describes "uneasy crowds" at the scene of the hostage taking earlier on Monday. The atmosphere in Martin Place itself was surreal, she says. Office workers who had been evacuated from their buildings, construction workers from nearby building sites and tourists packed the pedestrian plaza one block away from the Lindt coffee shop. Kathryn Cheem who works part-time at the Lindt cafe, described what it was like seeing her colleagues held hostage. "It shakes me to the bone, and they're people who I hold like another family," she told reporters. "You know I see them every day and hold them close to me.... It's good that I'm not there, but I just kind of wish that I could be there for them and tell them that everything's going to be all right." People who work in Martin Place or nearby have been asked to work from home on Tuesday because of the hostage incident. in the Herald Sun attacks what it calls the "despicable rubberneckers who took selfies and socked back beers and wine while they gawked at the Martin Place siege 100 metres away." "Lingering just so you can tweet a pic of yourself to your mates, or worse to grab a few coldies and settle in to watch the utter horror unfold like it's a movie at the cinema, is just deplorable," it adds. rundown on the BBC News website of what eyewitnesses have told the BBC they have seen so far. Ben Lopez, an expert in hostage negotiation, tells the BBC News Channel: "One of the reasons the police commissioner doesn't want to speculate too much is because it is very clear that the hostage taker is interested in media coverage. And one of the major things we want to do as hostage negotiators is control the flow of information in and out of the siege location. So if other people are calling in, or if the media is complicating things, it could make it difficult for the negotiators to do their job and to try to reach a safe outcome." In the news conference, the police commissioner stressed the need for calm. "Clearly reprisal attacks are something that should not happen. At this stage, we need to let everyone just settle down." Armed police officers stand guard near the cafe as the hostage situation continues into the night. on Facebook. It says: "The is a time for all Australians to stand together and support each other." tweets: Police keep talking about this maybe "going into tomorrow". Anyone have long memories about long(est) hostage situations in Australia? tweets: The #illridewithyou movement absolutely makes me proud to be Australian. The correct social response to a terrible isolated incident. More from the police commissioner: "I understand that no one has been injured, and if that is true we are grateful." Police Commissioner Scipione says: "If people are being contacted by hostages, we would ask that they ensure that the gunman inside speaks to our trained negotiators. They are the people that can help in this situation." He tells the news conference he cannot confirm how many people are being held inside, or what their identities are. Police Commissioner Andrew Scipione tells a news conference: "Our only goal is to get those people who are currently caught in that building out of there safely. Nothing will change." Mike Baird, Premier of New South Wales, says: "I'm proud of how we have responded as a city, a state and a nation. But my thoughts remain with those caught up in this event." ABC News in Australia is now reporting that the suspect is known to NSW Police. It says one of the country's commercial stations has received video from inside the cafe but are not broadcasting it. Australian news channels have broadcast this image apparently showing the suspected gunman. It is yet to be verified. BBC's Newsday programme he saw "people up against the windows". They were "face first with their hands in their air," he said. "Just a horrific situation unfolding here." Earlier, Australia's Muslim community released a joint statement saying it condemned "this criminal act unequivocally". The Australian National Imams Council and the Grand Mufti of Australia said that "such actions are denounced in part and in whole in Islam". says the lights have just gone off inside. Police have asked media organisations not to air any of the gunman's demands or what the hostages have told them in calls from the cafe. BBC Monitoring's Catherine Gusse describes media reaction around the world. She says contributors on television news channels in Iran and China have been speculating about the possible political motives for the attack. Russia's Channel One says "a new epoch may have begun for prosperous Australia, which has been keeping its neutrality for a long time". Josh Acton, who works in a building opposite the cafe, told the BBC about the moment the situation unfolded. "All the police cars started to turn up, and undercover police came running at everyone saying 'Clear the area immediately, get out'," he said. "We were in lockdown for most of the day and we've managed to evacuate about an hour ago. Everything is closed off, there's police on every corner and they're doing their best to contain the situation and keep people calm." Here's another image of one of the five people who fled the cafe earlier. says the black and white flag displayed by the gunmen in Sydney is similar but not the same as the Islamic State flag, which is a much cruder script. He says this one is essentially the same Arabic inscription from the Koran as that displayed on the Saudi national flag, which uses a green rather than a black background. Most people on Twitter are urging people to show calm and not target any specific community over the incident, says BBC Monitoring's Vikas Pandey. However, some others have been quick to blame the jihadist group, Islamic State, for the siege. On social media, the hashtag #sydneysiege is the top global trend on Twitter. Other hashtags like #siege, #MartinPlace are also trending. reports: "All the hostages now huddled at one end of Lindt Cafe, one is covering the window at that end with an apron." Earlier he saw food being brought out from kitchen by staff and distributed to other hostages. Twitter users are circulating a screenshot of a woman's Facebook post, where she says she is a hostage, and lists the gunman's demands. The screenshot was purportedly taken by a friend of the woman. Police have said they are monitoring all communication channels. tweets: Deputy Commissioner Burn: "Our approach is to resolve the situation as peacefully as possible. The priority is the safety of all involved." Earlier PM Tony Abbott praised the people of Sydney for "the calmness with which they have reacted to this disturbing incident". He said: "We are a free, open and generous people and today we have responded to this in character.... Yes it has been a difficult day. Yes it is a day which has tested us but so far, like Australians in all sorts of situations, we have risen to the challenge." has tweeted: I was briefed overnight on the siege in Sydney. It's deeply concerning and my thoughts are with all those caught up in it. Deputy police commissioner Catherine Burn says that the five hostages who left the cafe "are now being assessed to make sure their health is okay and then police will talk to them". She would not confirm how many are left in the cafe. Here are images from earlier of two women who fled the cafe. They were wearing brown uniforms with the Lindt logo. New South Wales deputy police commissioner Catherine Burn told reporters she cannot confirm demands by the gunman as reported by media outlets. "We have to deal with him on the level of police negotiation. We cannot engage in speculation." If you are just joining us, the latest situation is that armed police are surrounding the cafe and officers have made contact with the gunman. Five people have been seen running from the building but it is not clear how many remain inside. A black Islamic flag has been displayed at the window. the original link to view updates from the past seven hours. Welcome to the BBC's live updates on the hostage situation in Sydney, Australia, where a gunman is holding staff and customers inside the Lindt cafe in the city centre.